In this chapter, we examine two additional morphological categories — Modality and Level — as well as the morpho-syntactic process called Incorporation and its associated morphological category Format. Modality and Level are shown via a word separate from the formative itself, the verbal adjunct. The concept of adjuncts was previously discussed in Section 2.4 and 2.4.2. A verbal adjunct is placed either immediately preceding or immediately following a verbal formative, and provides additional morphological information about the formative. Note that, in addition to conveying Modality and Level, the verbal adjunct also has slots for conveying certain categories usually conveyed by the formative, specifically Valence, Phase, Sanction, Illocution, Aspect, Mood, Bias, and Extension. Therefore, a verbal adjunct can be used to convey these other categories in order to decrease the number of syllables of the formative and facilitate pronunciation/euphony of the sentence as whole. This is discussed in Section 6.3. The Cs aspectual infix in Slot E is mandatory, even if it carries a null value (i.e., no aspect). The Cs consonantal affix will always contain one of the specialized dyssyllabic geminate clusters described in Section 1.2.1.3, written n-n, m-m, l-l, r-r, etc. as well as various other syllabic consonant clusters, e.g., l-m, l-n, r-m, r-n, and r-ň. The second member of the dyssyllabic consonant cluster always carries the word stress and tone in a verbal adjunct. It is the appearance of such a dyssyllabic geminate cluster as the last, or second-to-last consonantal form in the word that identifies the word to readers/listeners as a verbal adjunct. The default tone of a verbal adjunct is falling. However, variations in the tone of a verbal adjunct can be used to convey the accompanying formative’s Extension category, in order to simplify the phonetic structure of the Formative's Ca affix (see Chapter 3) for purposes of euphony and ease of pronunciation. This is discussed in Section 6.3.5 below. Modality corresponds roughly to the function of both modal verbs in Western languages (e.g., can, may, must, should, etc.) as well as those verbs which modify a following verb such as to want to, to choose to, to need to, to offer to, to demand that, etc. However, in Ithkuil, the effect of such modifications on a verb causes a fundamental change in the cognitive interpretation of the verb, usually resulting in a modification of both the Essence (see Sec. 3.5) and the Perspective (see Sec. 3.3) of the verb, as well as invoking the use of the ACTIVATIVE case to mark the “subject” noun (see Sec. 4.3.9). The nature of these modifications is explained as follows: As we saw in Sections 3.5 and 4.3.9, it is possible in human language to speak about events that are either unreal, as-yet-unrealized, or alternative versions of reality. Specifically, nouns and verbs can make reference to hypothetical representations of real-world counterparts from within an “alternative mental space” created psychologically (and implied linguistically). This alternative mental space is essentially the psychological realm of potential and imagination. It is seen, for example, in the following sentences. 1) You must come home at once. 2) That girl can sing better than anybody. 3) Our troops should attack at dawn. 4) Mother needs you to come with her. 5) The teacher requests that I dance for you. 6) The man believes clowns are dangerous. Each of the above sentences describe potential or unreal events, not actual real-world happenings that are occurring or have occurred. In Sentence (1) no one has yet come home, in Sentence (2) the girl may choose never to sing again, Sentence (3) does not tell us whether any attack will actually occur, Sentence (4) does not indicate whether you will come or not, Sentence (5) does not indicate whether I will dance, nor does Sentence (6) establish whether or not clowns are, in fact, dangerous.Because the clauses following the verbs must, can, should, need, request, believe, in the above sentences all refer to unrealized, imagined, or hypothetical events, the nouns and verbs within those clauses would be marked in the ABSTRACT perspective (see Sec. 3.3) and the REPRESENTATIVE essence (see Sec. 3.5). The “subject” nouns which invoke the event (the nouns you, girl, troops, mother, teacher, and man in the six sentences above) would be marked in the ACTIVATIVE case (see Sec. 4.3.9). It should be noted that not all Ithkuil modalities necessarily invoke hypothetical or unrealized events. For example, in the sentence She chose to move to Australia, the verb chose signals that the following clause is spoken of abstractly (i.e., it is the act of choice that is being talked about, not the move itself), but nevertheless refers to an actual event (i.e., she did, in fact, move to Australia). Thus, the move to Australia clause would be marked in the ABSTRACT perspective but would not be marked in the REPRESENTATIVE essence. 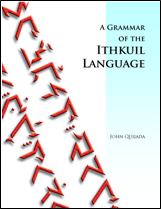 Thus, the requirement that an Ithkuil modality construction invoke modifications in the perspective, essence and case of the associated nouns and verbs is entirely dependent on the semantics and cognitive intent of the utterance. There are 30 modalities in Ithkuil. Modality is marked by the Vm vocalic affix in Slot D of a verbal adjunct. The 30 modalities and their respective Vm affixes are shown in Table 16 below. The function of each modality is described in the sub-sections following the table. The DESIDERATIVE more or less corresponds to English constructions expressing desire, e.g., to want to, to desire that, etc. as in The teacher wants the students to study hard. The ASPIRATIVE corresponds to English constructions expressing wishing or hoping, e.g., to wish that, to hope that, etc. The EXPECTATIVE corresponds to English constructions expressing expectation, as in He expected her to be beautiful, or I imagine he’s reached his destination. The CREDENTIAL corresponds to English constructions expressing belief, as in I think she has two sons, or We believe the earth to be round. Note that it does not correspond to English expressions of opinion, i.e., it would not be used in translating sentences such as I think she’s pretty. The REQUISITIVE corresponds to English constructions expressing requests, as in I request his presence at the banquet, or I’d like you to visit your father. The EXHORTATIVE corresponds to English expressions of exhortation or demand, as in I demand you return my book or Let the gates be opened! The OPPORTUNITIVE corresponds to the English modal verb can/could/be able where it means ‘have the opportunity to,’ as in Can we pass by our old house when we visit town? or Because of the delay, she was able to go to the museum after all. The CAPACITATIVE corresponds to the English modal verb can/could/be able where it means ‘have the ability or capacity to,’ as in Can she sing opera? or He could run like the wind. Note that it would also be used when translating English generic statements implying ability or capacity as in He speaks French like a native [i.e., the sentence does not imply he is speaking French at the moment, but rather his general ability to do so]. The PERMISSIVE corresponds to the English modal verbs can/could/be able or may/might where they mean ‘be permitted to,’ as in Very well, you can have ice cream for dessert; or Could I talk to you? The POTENTIAL corresponds to the English modal verb can/could/be able where it means ‘have the potential to or the possibility of,’ as in Remember it can flood suddenly in this area, or That man could fly into rages for no reason. It is also used when translating generic statements implying potential or possibility, as in It rains unpredictably in the Northwest. The COMPULSORY corresponds to the English modal verbs must or have to/had to in their meaning of compulsory obligation, as in You must get up now, or I had to attend the ceremony. The OBLIGATIVE corresponds to the English modal verbs should, ought to, or other phrases expressing optional but preferential obligation, as in You ought to see a dentist, I should tell her how I feel, or It would be best if the children stayed away from clowns. The IMPOSITIVE corresponds to English expressions such as be supposed to, be expected to, or be to which impose an expectation upon a party, as in You’re supposed to smile when introduced, or He is to give a speech at the banquet. The ADVOCATIVE corresponds to English expressions such as suggest that or propose that which advocate a position, as in I suggest you study harder or They proposed that the clowns take their circus tent elsewhere. The INTENTIVE corresponds to English expressions such as intend to, plan on or shall which convey an intention, as in The girls plan on travelling to Europe, or I shall see to it. The ANTICIPATIVE corresponds to English expressions such as to look forward to or to eagerly await which convey positive anticipation, as in We look forward to the clowns coming to town. The DISPOSITIVE corresponds to the English expression to be willing to, conveying willingness as in He is willing to give his life to defeat the clowns. The PREPARATIVE corresponds to the English expressions be ready to or be prepared to, indicating readiness, as in She’s ready to host the party, or They are prepared to endure harsh weather. The NECESSITATIVE corresponds to the English expressions need to or be necessary to, indicating necessity, as in You need to do something about those clowns in the yard, or It was necessary to inform her about the atrocities. The DECISIVE corresponds to English expressions such as decide to or choose to, indicating choice, as in Peter decided to cook breakfast or Colleen chose to visit the clowns. The PROCLIVITIVE corresponds to English expressions such as tend to, be apt to, or be prone to, indicating tendency, as in The wolverine tended to eat platypus eggs, or Boris is apt to make a fool of himself when meeting women. The VOLUNTATIVE corresponds to English expressions such as offer to or volunteer to, indicating an act of offering as in The foreman offered to put poison in my beer, or Mrs. Blathermot volunteered to bake artichoke pie for the Open House event. The ACCORDATIVE corresponds to the English expression agree to, as in Constance agreed to perform her go-go number at the talent show. The INCLINATIVE corresponds to English expressions such as to feel like or be up for, indicating an impulsive desire, as in He’s up for going to the shindig, or Molly felt like eating the entire chocolate cake. The COMPULSIVE corresponds to English expressions such as feel driven to or feel a need to, indicating compulsion, as in Jack feels driven to hunt wolverines, or My hairdresser feels a need to date bikers. It is marked by addition of the suffix -uï to a conflational or valence adjunct. The DIVERTIVE corresponds to English expressions such as like to, or enjoy, conveying simple likes and pasttimes as in Boys like to dream about cars, or My salamander enjoyed biting people on their rump. The DEVOTIVE corresponds to English expressions such as be devoted to or be committed to, indicating devotion as in Charlotte is committed to being the best seamstress in town, or They were devoted to rooting for the losing team. The PREFERENTIAL corresponds to English expressions such as prefer, or would rather that, indicating preference as in He’d rather work by himself, or Muldane prefers that his cats eat live food. The IMPRESSIONAL corresponds to English expressions such as have an impression that, have a hunch that, or feel that, indicating a subjective belief or impression as in I’ve a hunch that the porter is an alcoholic, or Betty feels her husband flirts too much with the secretarial pool. The PROMISSORY corresponds to English expressions such as promise, or swear that, indicating a self-imposed obligation as in She promised that her son would visit my daughter, or Hargreaves swears that the fish from that lake are sentient. The two of them like writing to each other. She and I are planning on taking a walk later on. The valley is expected to be awe-inspiring. The dog wanted to play some more. Level corresponds roughly to what is known as degree of comparison in other languages. Many languages morphologically indicate degrees of comparison as exemplified by the English suffixes -er and -est seen in great-greater-greatest, or alternately with the adverbs more and most, as well as their negative counterparts less and least. The Ithkuil comparison schema is much more complex than those found in natural languages and is designed to eliminate various ambiguities that arise from those simpler schemata, as discussed below. (a) Jane's state of health has improved, although she is still unwell. (b) Jane's state of health has improved so that now she is well (whereas before she was unwell). (c) Jane's state of health is even better than it previously was (i.e., she was healthy before, but is even healthier now). (d) Jane's state of health is not as poor as someone else's state of health (although neither Jane nor the other person are well). (e) Jane's state of health is better than someone else's state of health, so that Jane can be considered healthy while the other is unwell. (f) Jane's state of health is better than someone else's state of health, even though both can be considered healthy. (a) Jane's state of health is not as poor as Sue's although both are unwell. (b) Jane's state of health is better than Sue's, so that Jane can be considered well while Sue is unwell. (c) Both Jane and Sue are healthy, but Jane's state of health is even better than Sue's. (d) Jane's state of health is not as poor as Sue's (although neither Jane nor the other person are well). This sort of ambiguity allows odd-sounding sentences such as Snow is warmer (e.g., than liquid nitrogen) to be perfectly grammatical. What is important to note about the above analysis is that the words healthier or warmer do not indicate in the actual context of usage whether a person is actually healthy or whether snow is actually warm. Rather English -er and -est (and more and most) as well as their negative counterparts (less and least) merely serve to indicate on a relative scale a relationship between two entities being compared (or where only one party is mentioned, in relationship to some unspecified standard or expectation). Additional statements are needed to clarify the actual context to determine where the entities fall on the quantitative "spectrum" or range of the particular quality or attribute pair in question, e.g., unhealthy <—> healthy. The comparison scheme of Ithkuil has been designed to inherently specify such relative comparison while simultaneously specifying placement within the qualitative spectrum, so that ambiguity as to whether “healthier” means the person is well or unwell is eliminated. An additional aspect of Ithkuil comparison is the concept of relative comparison versus absolute comparison. This is an important concept which impacts the truth value of a statement based upon context. Specifically, relative comparison allows for statements to be true within the narrow confines of the context-at-hand, whereas absolute comparison allows for statements to be true without reference to any specific context. This can be illustrated by the following examples. (a) Sirius is the brightest star in the night sky. (b) That highway is the fastest way into town. Both of these sentences are true in certain pragmatic contexts and not true in others. For example, while Sirius is the most luminous star as seen from Earth, this is merely due to its relative nearness to Earth (8.4 light years) as compared to most other stars. There are thousands of known stars which are larger (and inherently more luminous) than Sirius but are much further away from Earth. So Sentence (a) is true in a relative context but false in an absolute context. Similarly the highway in Sentence (b) may be the fastest way in most conditions, but if there is a traffic jam or an accident blocking the highway, or if one has access to a private helicopter, then the statement would be false. Therefore, it is only true in a narrow context determined by the pragmatics of the moment it is spoken. Ithkuil allows speakers to specify whether a comparison is to be interpreted within the context-at-hand (relative comparison) or as an absolute statement irrespective of the context-at-hand. There are nine comparison operators for the Ithkuil verb, called Levels, which specify the comparative relationship involved, e.g., same as, more than, less than, etc. These levels are marked by a word-initial vocalic prefix to the verb, Ve. Each prefix comes in two varieties, to distinguish between relative versus absolute comparison. Additionally there is an unmarked default zero-level in which no comparison is being made). The presence of a Ve prefix in Slot B of the verbal adjunct requires Slots C And D to be filled by their respective affixes as well. NOTE: As an alternative to using Ve, Level can also be conveyed by the suffixes -V1mļ and -V2mļ added to the formative (placed in Slot XI), explained in Section 7.4.13 - LVL suffix. In interpreting the meaning of the various Levels, the terms used in the formulas refer to the following X-M-(Y) model, where M represents a verb or an adjectival description, X is the "subject" of the verb, and Y is the standard being compared to. Note that the meaning of each Level allows for an interpretation in which there is no Y term so that the standard of comparison is a previous state of X, e.g., the difference between Sue dances better than Mary versus Sue dances better than before. Note that in verbal adjuncts where Valence is marked by a word-initial CL consonantal prefix in Slot A (see Sec. 6.3.4), but there is no Level, the neutral value of Ve in Slot B is ë. In addition to Level, there are 24 specialized noun cases which identify the exact nature of the comparison in relation to the quantitative spectrum, range, or standard for the particular attribute, quality, or act in question. These cases are applied to the noun to which something is compared, i.e., the term Y in the above formulas. So, for example, in the Ithkuil translation of the sentence Jane is healthier than her sister, the equivalent to is healthier would be shown by a Level prefix meaning "more than" applied to a formative meaning "manifesting a state of health," while the phrase corresponding to than her sister would be the word sister marked for a case which specifies whether the other noun to which the sister is being compared (i.e., Jane) is now well, or is nevertheless still unhealthy, etc. "in comparison to Y, where X Q in terms of reference standard S"
where Q indicates the change (or lack thereof) in X over time and S indicates an external standard of comparison for M. An example of this formula in use would be where the term Q = "was previously less M than Y" and S = "although X (still) isn't very M compared to some external standard or expectation of M-ness" applied to the sentence Jane is healthier than Sue, now disambiguated to mean that Jane, while being in a healthier stated than Sue, still isn't very healthy. The eight values of Q combine with the three values of S to give the specific meanings of the 24 comparison cases as shown below in Table 18. As with the 72 primary cases (see Chapter 4) the 24 comparison cases are shown by the Vc infix to the formative in Slot VIII. Since Level affixes modify a verb directly, there is still a potential for ambiguity due to the fact that Levels and the Comparison cases specify the relationship between two entities being compared, but they do not specify the particular parameter of the term M. In other words, the verb "laugh" in the SURPASSIVE Level might be best translated as "out-laugh," as in Sam out-laughed George, but we still do not know if this means the laugh was louder, longer, or "harder." Therefore, verbs marked for Levels often take the COS suffix as well, to specify the parameters of the quality or act in question. This suffix is found in the list of derivational suffixes in Chapter 7, but is shown here as well, for the sake of convenience. (See Chapter 7 for an explanation of the nine degrees and three suffix-types associated with derivational suffixes). It is clear the woman’s eyesight has improved, but she still doesn’t see as well as the man, who doesn't see very well either. The cat is now at least as sick as the dog, if not more so, whereas previously only the dog was sick. In Chapter 5 we discussed the verbal categories of Mood, Aspect, Bias, Phase, Sanction, Illocution, and Valence, and showed how each of these categories is manifested by various affixes within the structure of a formative. However, the structure of the verbal adjunct, discussed at the beginning of this chapter, allows for each of the aforementioned morphological categories to alternately be displayed via a verbal adjunct rather than a formative. This is often desirable for purposes of phonological euphony or to address the limitations of phonotactic constraints (see Section 1.4). The sub-sections below discuss the specifics on the alternate representations of these categories via a verbal adjunct. The categories of Mood and Aspect were previously discussed in Section 5.2 and Section 5.10 respectively. Mood is normally shown (along with Illocution) via the Ci+Vi infix to a formative in Slot IX, although it can alternately be shown along with Aspect via the Cs affix to a formative in Slot III. However, the use of the Cs affix in Slot III of a formative, unless required by the presence of affixes in Slots I or II, is generally undesirable as its presence adds two syllables to the length of the formative. Therefore, as an alternative, Aspect and/or Mood can be conveyed by the same Cs affix within a verbal adjunct in Slot E. This Cs affix is mandatory for all verbal adjunct. The second syllable of the Cs affix (i.e., the second member of one of the dyssyllabic consonant clusters l-l, m-m, n-n, ň-ň, r-r, l-m, l-n, r-m, r-n, and r-ň) always receives the syllabic stress and tone in a verbal adjunct. A second verbal aspect can be shown within a verbal adjunct utilizing the Vs affix in Slot F. Each of the 32 aspects, in addition to their consonantal Cs form, has a vocalic affixual form Vs, shown in the table below. Bias was previously discussed in Section 5.11, shown by the word-final Cb suffix to a formative. As an alternative, however, the same Cb suffix can instead be placed in word-final position on a verbal adjunct (in which case a Vs affix in Slot F becomes mandatory). The forms of Cb used in verbal adjunct are the same as those used with formatives, except that, unlike formatives, there is no preceding glottal stop. See Table 15 in Section 5.11.1 for the specific Cb suffix for each bias. The categories of Phase, Sanction, and Illocution were previously discussed in Sections 5.5, 5.6, and 5.3 respectively. In a formative, they are shown by a combination affix, Cv, placed in Slot V, or if an incorporated stem is present, in Slot I. Alternately, however, they may be shown by the same Cv affix in Slot C of a verbal adjunct (which entails the mandatory presence of a Vm modality infix in Slot D). The forms of Cv for a verbal adjunct are the same as those for formatives, shown in Tables 11(a) through (f) in Section 5.5. The category of Valence was previously discussed in Section 5.7, shown by the vocalic prefix, VL in Slot VI, or, if an incorporated stem is present, in Slot II. Alternately, however, Valence may be shown by consonantal counterpart to the VL prefix, CL, placed in Slot A of a verbal adjunct (which entails the mandatory presence of affixes in Slots B, C, and D). The category of Extension is normally shown by means of the Ca affix in Slot X of the formative (see Sections 2.1, 3.4 and 3.5.3). However, in order to simplify the phonological structure of the Ca affix for purposes of euphony, Extension may be shown via the tone of the adjacent verbal adjunct. The default tone of a verbal adjunct is falling, which indicates deferral of Extension information to the Ca affix of the formative. Otherwise, Extension is conveyed by the following shifts in tone of the verbal adjunct. 1. He bicycled south. = He traveled south by bicycle. 2. She dolled herself up. = She made herself look as pretty as a doll. 3. They’re shelving the books. = They’re putting the books on the shelf/shelves. 4. Slide me a beer. = Give me a beer by sliding it (e.g., along the bar). The above sentences show four verbs which respectively carry inherent senses of vector movement, transformation, positioning/placement, and giving. The patterning of such “conflated” verbs is usually random and haphazard in any given language. For example, the English to bicycle in sentence (1) means ‘to travel by means of bicycle,’ not ‘to make a bicycle’ or ‘to be a bicycle.’ On the other hand, the verb to doll up does not mean to ‘travel by doll,’ but rather ‘to make appear like a doll.’ Yet, to shelve means ‘to place on a shelf,’ not ‘to travel by means of shelves’ or ‘to make appear like a shelf.’ And none of the verbs in the first three sentences connotes the idea of giving or conveyance as does slide in sentence (4). = She dolled herself up. = They’re shelving the books. = Slide me a beer. Note that the particular unspoken covert and overt senses (shown by the numerals 1 and 2 in the above analyses) are specific to any given verb and must be subjectively learned by the listener, i.e., a speaker of English must learn that to hand means to GIVE by MEANS of one’s hand, but to shoulder does not mean to GIVE by MEANS of one’s shoulder. Thus, while conflation of verbs presents a potential opportunity for instantiating verbs with patterns of overt and covert meaning, the lack of systemization prevents one from knowing with certainty what pattern to use when attempting to interpret the usage of a verb form. Ithkuil systemizes verb conflation into a productive scheme, in which any formative stem can be incorporated directly into another formative stem. The operational sense of the incorporated stem and its semantic relation to the primary formative stem is conveyed by a morphological category called format (discussed in Section 6.4.1 below). The incorporated stem is shown via the Cx and Vp affixes in Slots V and VI, where Cx indicates the root and Vp its Pattern, Stem and Designation. Format is shown as part of the Vf prefix which also shows the category of Context (previously discussed in Section 3.6). If an incorporated stem is present (i.e., Cx and Vp are present in Slots V and VI) then a Vf affix showing the incorporated stem’s Format must also be present in Slot XII (see Section 6.4.1 below for an explanation of Format). The values for the Vp infix are shown in Table 22 below. As described above, a conflated verb in English can convey different senses such as means, manner, or location, the specific sense being learnable only through actual usage and context. In Ithkuil, this sense is overtly identified by the format of the verb, shown by the Vf affix in Slot XII. The Vf affix was previously discussed in Section 3.6 on Context. Table 23 below shows the values of Vf. For verbs carrying STATIVE Function (see Sec. 5.1.1), the SCHEMATIC format indicates that the incorporated stem characterizes the primary stem, i.e., the primary stem has the characteristics, behavior, or acts like the incorporated stem. For verbs carrying MANIFESTIVE Function (see Sec. 5.1.3), the SCHEMATIC format indicates that the incorporated is equivalent in identity (i.e., a copula relationship) to the primary stem, i.e., the primary stem is the incorporated stem in an existential sense. For verbs carrying DESCRIPTIVE Function (see Sec. 5.1.4), the SCHEMATIC format indicates that the incorporated has the superficial appearance or physically or (metaphorically) resembles the primary stem, i.e., the primary stem resembles/looks like the incorporated stem. The INSTRUMENTATIVE format indicates that the incorporated stem specifies the means, cause, or instrument of causation of the conflated primary sense, so that the sentence I clubbed him would be translated by incorporating the stem for ‘club’ into the stem for ‘hit/beat’ plus the INSTRUMENTATIVE format, rendering a sentence literally translatable as I club-hit him or I club-beat him [= I hit/beat him with a club]. The AUTHORITIVE format indicates that the incorporated stem specifies the entity of which the primary stem is the indirect/enabling cause or derivational source. So, for example, the Ithkuil translation of the English sentence He sang her cares away (= his singing allowed her to forget her cares) would incorporate the verb ‘forget’ into the verb ‘sing’ with AUTHORITATIVE format, the party ‘he’ in the EFFECTUATIVE case, and the party ‘she’ in the AFFECTIVE case. The PRECURRENT format indicates that the incorporated stem specifies an initial event immediately preceding or continuing on into the main verb , where the initial event is not the cause of the conflated sense, i.e., the main act/state/event would have occurred anyway, e.g., I bought some lunch (conflated sense: EAT). First X, then Y (non-causal). The AFFINITIVE format indicates that the incorporated stem is associated with, represents, or acts in behalf of the primary stem. So, for example, the English sentence ‘They are a group of sports officiators’ would utilize the stem for ‘sport’ incorporated into the stem for ‘officiate’ along with the AFFINITIVE format. They are a group of sports officiators. In addition to the nine formats shown solely by the Vf vocalic suffix described above in Section 6.4.1, the category of Format can be expanded via a set of specialized suffixes, so that an incorporated root can be associated with any of the 72 main noun cases from Chapter 4. Additionally, these suffixes allow the categories of Configuration (see Sec. 3.1) and Perspective (see Sec. 3.4) to be specified for the incorporated root. The specifics of how these suffixes work are described in Section 7.4.15.
in book form, it is now available! wrote with my twin brother Paul, also now available! ©2004-2011 by John Quijada. You may copy or excerpt any portion of the contents of this website for private, individual, or personal use which is non-commercial in nature and not for purposes of profit. Otherwise, you may copy or excerpt brief portions of the contents of this website in published, web-accessible, or commercially distributed articles, papers or webpages for purposes of review, commentary or analysis, provided you give full attribution to the author and this website.